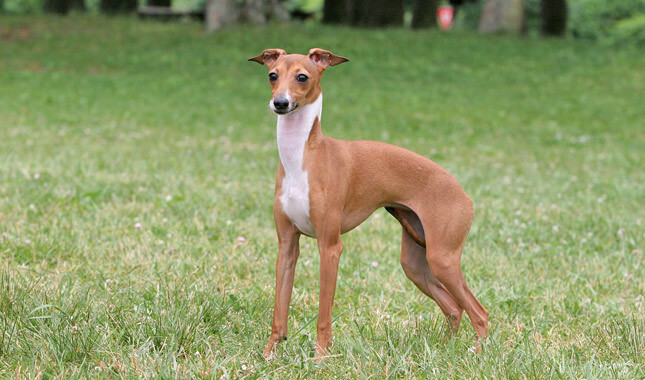 he Italian Greyhound is very similar to the Greyhound, but much smaller and more slender in all proportions and of ideal elegance and grace. Narrow and long, tapering to nose, with a slight suggestion of stop. Skull - Rather long, almost flat. Muzzle - Long and fine. Nose - Dark. It may be black or brown or in keeping with the color of the dog. A light or partly pigmented nose is a fault. Teeth - Scissors bite. A badly undershot or overshot mouth is a fault. Eyes - Dark, bright, intelligent, medium in size. Very light eyes are a fault. Ears - Small, fine in texture; thrown back and folded except when alerted, then carried folded at right angles to the head. Erect or button ears severely penalized. Long, slender and gracefully arched. Of medium length, short coupled; high at withers, back curved and drooping at hindquarters, the highest point of curve at start of loin, creating a definite tuck-up at flanks. Shoulders - Long and sloping. Chest - Deep and narrow. Long, straight, set well under shoulder; strong pasterns, fine bone. Long, well-muscled thigh; hind legs parallel when viewed from behind, hocks well let down, well-bent stifle. Harefoot with well-arched toes. Removal of dewclaws optional. Slender and tapering to a curved end, long enough to reach the hock; set low, carried low. Ring tail a serious fault, gay tail a fault. Skin fine and supple, hair short, glossy like satin and soft to the touch. Any color and markings are acceptable except that a dog with brindle markings and a dog with the tan markings normally found on black-and-tan dogs of other breeds must be disqualified. High stepping and free, front and hind legs to move forward in a straight line. Height at withers, ideally 13 to 15 inches. Disqualifications: A dog with brindle markings. A dog with the tan markings normally found on black-and-tan dogs of other breeds. Click Here to see required genetic breed tests for dog breeds beginning with the letter I.
Click Here to Learn about breeder background checks on Italian Greyhound breeders if you are looking for Italian Greyhound puppies for sale. Click Here to learn how ResearchBreeder.com can help you find healthy Italian Greyhound puppies for sale.Click Here to learn how ResearchBreeder.com can help you find healthy Italian Greyhound puppies for sale. Click Here to order a Breeder or Kennel Background Check on Italian Greyhound Breeders that may have Italian Greyhound puppies for sale. Click here to find the national breed club for Italian Greyhound puppies for sale. Click Here to purchase a list of approved ResearchBreeder.com Italian Greyhound Breeders who have Italian Greyhound puppies for sale.